So, I left that one on and did a fun and classy looking design on the rest of them. 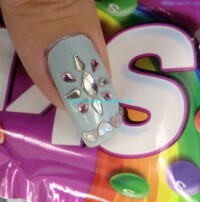 This is actually a easy nail art design. I think the colors make them look very classy. A run through of this design for you. 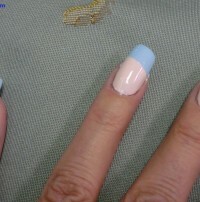 I then painted two coats of Sinful Colors “Easy Going” on my nails. Once those were good and dry, I peeled away the painters tape to revel my non-lacquered free edges. 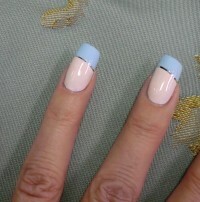 Let that dry really well and apply silver striping tape to divide the two colors. 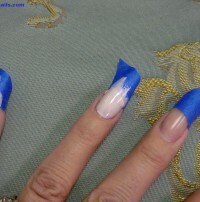 Apply top coat to seal in the tape and give shine to the nails. And your good to go. I painted the middle finger on my right hand solidly with “Mint Candy Apple” and applied shiny bling to the nails as a accent on the other hand. I thought his evened out the hands nicely.